Index. Are you looking for terms starting with HES? Hes is sometimes a misspelling of here or his. Hes a.k.a. Mark Arbib: Mark Victor Arbib is a former Australian politician and trade unionist, who was a Labor member of the Australian Senate from July 2008 to 5 March 2012, representing the state of New South Wales. He was the Australian Labor Party State Secretary of the New South Wales branch from 2004 to 2007. In February 2009, he was appointed Parliamentary Secretary for Government Service Delivery, a position within the Department of Prime Minister and Cabinet. He later served as Minister for Indigenous Employment and Economic Development, the Minister for Sport and Minister for Social Housing and Homelessness. On 27 February 2012, after former prime minister Kevin Rudd failed in an unsuccessful leadership challenge to Prime Minister Julia Gillard, Arbib announced he would shortly be resigning as a minister and senator. His resignation from the ministry was effective 2 March, and his resignation as a senator was submitted on 5 March. Hes a.k.a. Shane Abbess is a film director, a film producer and a screenwriter. There are other people with in their name, like Bohumil Hes and Christelle Hes. Hes a.k.a. Hermiston Municipal Airport is a city-owned, public-use airport located two nautical miles southeast of the central business district of Hermiston, in Umatilla County, Oregon, United States. HES is a 2013 Clio Awards Nominee. Hes a.k.a. ribosome binding protein 1 homolog 180kDa (dog) is a gene. HES is a rare disorder characterised by persistent and marked eosinophilia and a poor prognosis because of end-organ damage (particularly Figure 1.4.11 Haemophilia—spontaneous bleeding into joints (haemarthrosis) can be crippling . Studies begun by Dr. Hans von Ohain in 1933 led to a propulsion process in which compression and expansion were separated and carried out by a turbo compressor and turbine respectively. 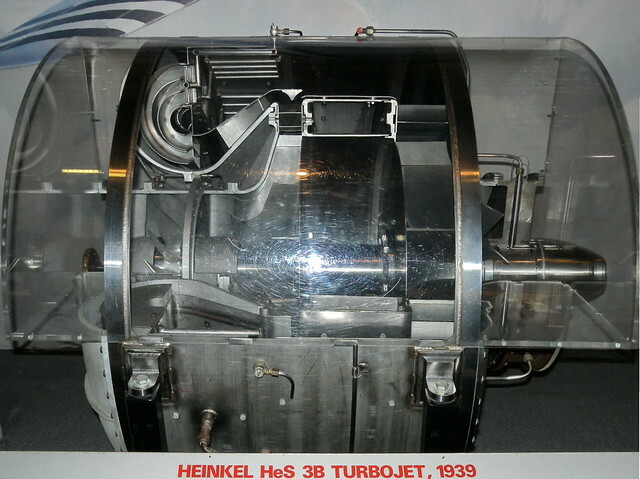 A model jet engine only partially functioned correctly, indicating a need for systematic development effort with industrial support and funding, leading to his employment with the Heinkel Corporation. Von Ohain's gaseous hydrogen-powered turbojet engine designated HeS 1 ran successfully in early 1937. The HeS 3B engine, which evolved in 1938, used internal fuel gasification initially rather than the desired atomized liquid fuel injection system used in later versions. On August 27, 1939, the HeS 3B powered the Heinkel He 178 on the world's first flight of a turbojet powered aircraft. This non-working reproduction was built by the German Engine Industry under the leadership of the M.T.U. Co. at the request of the Deutsches Museum of Munich, Germany, from plans drawn by Dr. von Ohain. See also the pronunciation examples of Hes! See also the blanagrams of Hes! Go to the usage examples of Hes to see it in context!